Startup stories rarely focus on the product or service but on the valuation and funds raised, as if that's what's most important about a company. Valuations are a trend story but on an individual basis, it says little about the viability of a startup business, or the innovations it is pioneering. Many people get excited or upset about valuations of startups, even though it does not reflect any actual value — as in a public stock company — it simply reflects the views of a very small number of private investors in a private company. The numbers are sort of made-up. For the most mature startups, investors agree to grant higher valuations, which help the companies with recruitment and building credibility, in exchange for guarantees that they'll get their money back first if the company goes public or sells. They can also negotiate to receive additional free shares if a subsequent round's valuation is less favorable. Billion-dollar companies join a club of "unicorns," a term used to explain how rare they are. But there are more than 50 of them now. There's a new buzzword, "decacorn," for those over $10 billion, which includes Airbnb, Dropbox, Pinterest, Snapchat, and Uber. It's a made-up word based on a creature that doesn't exist. Here's where things start to get tricky: Buried in their corporate filings, startups tuck away all sorts of provisions that reward investors for accepting these mega-valuations. 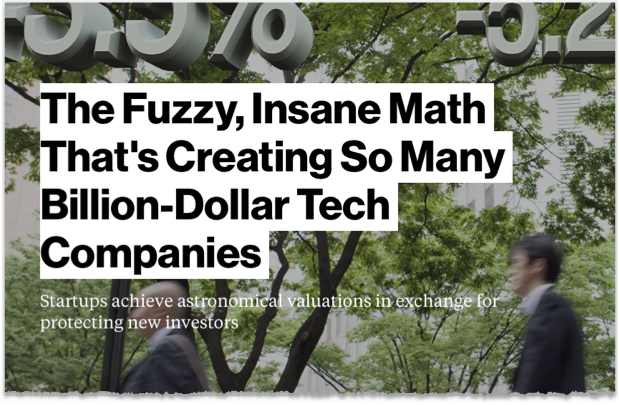 The practice is more regular and egregious in financing rounds for mature companies. Their capital requirements tend to be much larger, so they must turn to more sophisticated investment firms that demand these kinds of terms. Startups that are generous with these guarantees can garner much higher valuations. There is, however, a further number that's grounded in reality. It's the valuation based on common stock, which is generally what employees receive, and it's calculated by professional auditors. That figure usually isn't anywhere close to the headline number. "It may be 30 percent less; it may be 50 percent less," Kramer says. "They don't necessarily disclose that to the public until the time of their IPO." It doesn't seem fair that employees (after a typical four year vesting period plus risks) get about one-third to one-half less valuation than late-stage investors who can often cash out in six months or less. Employees often have to wait at least six months after an IPO to sell shares.